For the first time ever, scientists have witnessed and recorded a comet disintegrating in the Sun's atmosphere. The icy body — dubbed "comet C/2011 N3 (SOHO)" — was originally observed back in July. Today, the team that observed the comet flaming out of existence has published an in-depth analysis of what really happened. So what can we learn from the final moments of a dirty snowball passing too close to the Sun? A lot more than you'd think. First, some background. Comet C/2011 N3 (SOHO) - let's nickname it Icarus for short - belongs to a group of comets known as the Kreutz family. The Kreutz family is notorious for cruising perilously close to the sun's surface. When I say notorious I mean it — they do it all the time, and everybody knows it. 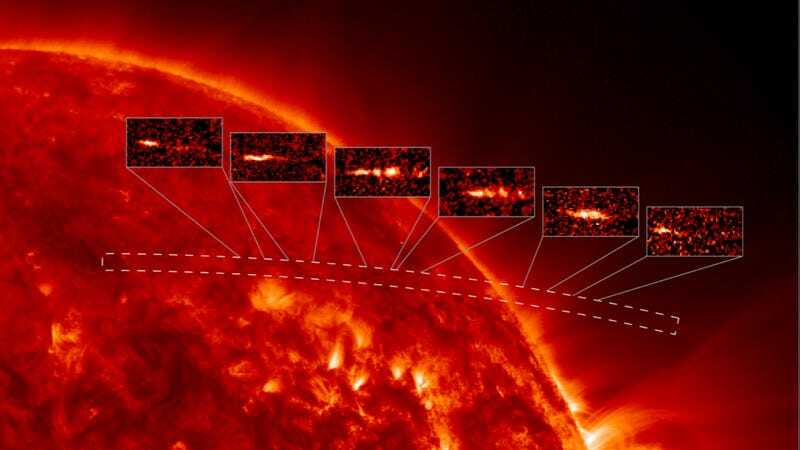 In the last ten years, solar monitoring observatories have detected over 1,600 members of the Kreutz family playing chicken with the Sun's corona; but for all those daredevil comets, not a one had been tracked making an entrance into its roiling, plasma-laden atmosphere. Consequently, nobody had ever seen what happens to a Kreutz comet in its final moments. But Icarus, as we're all aware, was different. When it made its death dive, researchers at NASA's Solar Dynamics Observatory were able to capture a 20-minute movie of Icarus' transit, a time lapse of which is shown here (the coronal mass ejection that you see shortly after the comet passes in front of the sun, while awesome-looking, is entirely coincidental). With the comet traveling at speeds exceeding 600 kilometers per second, those 20 minutes were enough to capture the comet's approach, its complete obliteration in the Sun's lower corona, and everything in-between. And it's these in-between moments that are really interesting. By combining data collected from three different solar observatories, astrophysicist Carolus Schrijver and his colleagues have managed to tease out impressive quantities of information about comet Icarus. How long it took to disintegrate, how far it was from the surface of the sun when it ceased to be, the varying rate at which mass was shed from the comet as it was exposed to temperatures approaching 2-million degrees fahrenheit — all of these things and more have been estimated and published in the latest issue of Science. Insets (with UTC times) show a subframe region containing the comet nucleus, coma [the cloud of dust and gas surrounding the comet's nucleus], and debris trail… The comet is moving from right to left across the face of the Sun in this image, and the nucleus is on the extreme left of each subframe; the debris trail is becoming fainter with time, as the comet dissipates and disintegrates in the corona. These observations, notes Lisse — who was not affiliated with the study — are the first of their kind. As such, she writes, the results of Schrijver and his colleagues are "pioneering a new method of cometary study." This new method of study will inform our understanding of not only how comets fall apart, but how they are put together; and that, explains Lisse, has the potential to shed important light on everything from the formation of our early solar system (helping explain, for example, how matter transforms from micrometer-sized specks of dust into planetary bodies) to the three-dimensional properties of the solar corona (by observing the way comets evaporate and disintegrate while passing through the Sun's atmosphere, astrophysicists could use icy bodies like Icarus to "map" the atmosphere's density structure). All that from watching a dirty snowball disappear as it crosses the face of the Sun. The researchers' findings — along with Lisse's perspective piece — are published in the January 20th issue of Science.